Zits is a comedic masterpiece --Stan Lee"
An engaging and fast read. A great recommendation for kids who have graduated from Diary of a Wimpy Kid. --School Library Journal"
Well-executed, clean fun with a heart. 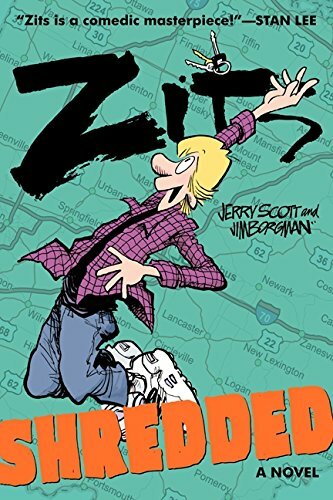 --Kirkus Reviews"
Zits jumps from the comics page to the bookshelf, and Zits: Shredded is perfect for fans of James Patterson's Homeroom Diaries as well as the Zits comic strip! Jeremy Duncan and his friends Hector and Pierce are hitting the road! That is, if they can squeeze enough french fries to get their newly veggie oil–powered van to Dog Tired Records in Sheboygan, Wisconsin. It's road trip time! Comics genius Stan Lee calls Zits "a comedic masterpiece." Featuring black-and-white illustrations on every page, Zits: Shredded is based on the hit syndicated comic strip.